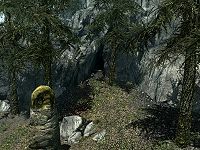 Forebears' Holdout is a small cavern located southeast of Dragon Bridge. The enemies within depend upon which side you ally yourself with in the main questline of the Dawnguard add-on. If you are with the Dawnguard, the cave is overrun with vampires led by Malkus. If you sided with the vampires, the cave is being guarded by the Dawnguard, led by Vanik who is trying to rescue the Moth Priest from the vampires. The entrance to the cave only appears once you start the related quest. To locate the entrance to the cave, take the road south-southeast from Dragon Bridge and cross over the bridge after the dragon bridge. On the far side of the bridge, regardless of whether you're a vampire or a vampire hunter with the Dawnguard, you'll encounter a carriage that's obviously been attacked. The horse has been killed, the carriage overturned, with the body of an Imperial soldier and a dead vampire nearby. The vampire carries instructions from Malkus to arrange an ambush on the road, south of Dragon Bridge and to take the Moth Priest to Forebears' Holdout for safekeeping. A short distance past the carriage, to the south, is a junction with a road heading towards Morthal. Taking this road, you'll find several patches of blood along it. The path leading to Forebears' Holdout heads south from the road and has more patches of blood along it. There are five columns of stone leading up to the entrance, which is flanked by two trees, with a thistle growing by one of the columns. Upon entering you will be in a natural tunnel, with a lit brazier in front of you. There is a white cap fungus on the right. Just after the brazier, the tunnel turns to the southwest and you will see that it opens out into a large cavern. There is another lit brazier on your left and another white cap behind it. There is also a fly amanita fungus further to the left. The tunnel opens out into a large cavern, at the top of a ledge, with a stone wall around the front edge and stairs leading down to the left. You can get a good view of the whole cavern from here. There are some places that are brightly lit and others in complete shadow. To the right you will see a powerfully flowing river pouring through the cavern from the south to the northwest. There is a stone pillar on the eastern shore of the river and the cavern floor far below. Opposite you on the western side of the river is a large partially destroyed fort with gargoyle statues and guards patrolling the top of the walls. You can see a large arch through the northeastern end of the structure with a large fire in the center of the courtyard beyond. Further in the distance you can see several sets of stairs. There is some kind of magical event in the southwestern part of the fort. Looking to the south you can see several stone pillars and columns with stairs leading down to the cavern floor. In the distance there is a bridge over the river which is being guarded by two death hounds or two armored dogs, one on either side of the bridge. Descending to the cavern floor you will find that there is plenty of vegetation and fallen trees. By backtracking to the north you will find two hanging moss on your right hanging off the path leading down, also to the north are two red mountain flowers, a bleeding crown and a fly amanita. At the bottom of the stairs you will need to take care of the death hounds. Be careful as it is likely that killing the first will alert the second. Between the stairs and the bridge are two more white cap mushrooms. Past the bridge to the south you can find another bleeding crown and by following a slope up right by the bleeding crown you can find a fly amanita. Crossing the bridge to the western shore, you'll need to take care as it is very brightly lit. There is nothing of interest to the south. Almost opposite the bridge are two more red mountain flowers and a bleeding crown against the wall of the fort. You will be able to hear some of the guards talking to each other above you. Heading north there is another bleeding crown to your right, on the shoreline and then two more red mountain flowers, also on the shore to your right. As you approach the large arch you could see from the ledge before descending, you will be in another brightly lit area. Past the arch against the wall is a white cap and further around you will find a place where the wall has fallen and been replaced by a wooden bridge over the gap to enable those on guard to reach the whole of the top of the wall. From the very end of the cavern to the northwest you can see into the middle of the courtyard and see the wooden stairs leading up to the top of the wall. The fire in the center makes the whole of the courtyard brightly lit, making sneaking difficult. If you are a vampire, a member of the Dawnguard and an armored troll will be standing near the fire. In the courtyard you can find a single white cap mushroom, between the wooden stairs and a door partially blocked by fallen masonry. At the rear of the courtyard to the west is a second smaller fire with spiral stairs up to the right of it and a balcony above. Before climbing these stairs to the left of the fire, in the corner against the wall is an apothecary's satchel on a barrel. There is a guard on the balcony who can be alerted by fighting in the courtyard or on the walls. At the top of the spiral stairs you will see the magical barrier holding the moth priest in front of you, this was the magical event you could see from the first ledge. There is also the corpse of one of the Imperial soldiers designated to guard the priest on the far side of the barrier. There are two guards and either Malkus or Vanik with Malkus' corpse by the barrier. You'll need to kill the guards and leader. Once done you are free to retrieve the Weystone Focus from Malkus' corpse and deactivate the barrier. There is an unlocked boss chest against the wall on the southern side of the barrier. There are five upright coffins around the wall on this level. There are stairs to the east that lead to the top of the tower and stairs to the west of the barrier, these lead to the Weystone Source activating this removes the focus from your equipment and deactivate the barrier. On the same level as the Weystone Source are three more upright coffins and to the right are more stairs leading to the top of the tower. There are only two further upright coffins on the top level. In the main cavern, there is a chest in the small alcove between the south wall and the largest tower. You can use the Whirlwind Sprint dragon shout to reach a ledge on the tower. From there, you can jump (or shout again) to reach the alcove on top of the wall. Alternatively you can descend the first flight of stairs from the highest level and then walk along a narrow ledge to the left of the same stairs. From the far end you can jump to the first ledge and from there to the ledge the chest is found on. You can jump back the way you came or drop down beside the bridge you initially crossed. This page was last modified on 8 July 2018, at 14:39.